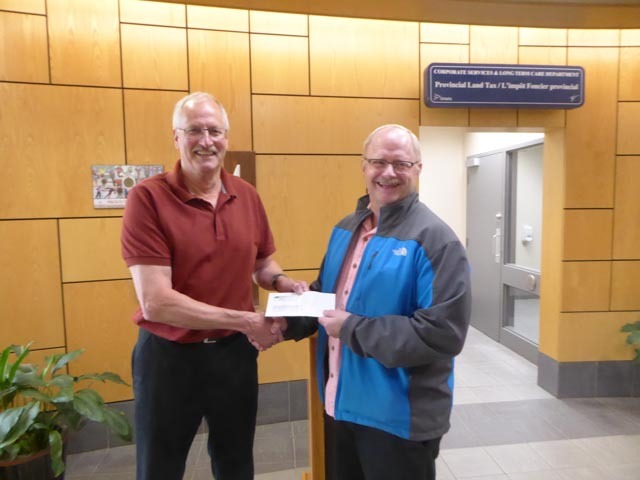 Herb Daniher, USW Rep in Thunder Bay, offers Thunder Bay & District Injured Workers Support Group board member, Jules Tupker, a cheque from USW members in Kapuskasing at the June 1st ceremony. The Thunder Bay & District Injured Workers Support Group was fortunate to be offered rent-free space at the Lakehead Labour Centre for many years. Since the destruction of the labour centre, we have had shared office space with the Canadian Injured Workers Alliance. This also marks the first time that we have had to pay rent since the Injured Workers Resource Centre, which was funded for a pilot project in the 90’s, closed. Without the support of many labour unions both local and in the district, we would be unable to offer support to other injured workers and their families. We are very grateful for all the support we receive, both financially and socially. 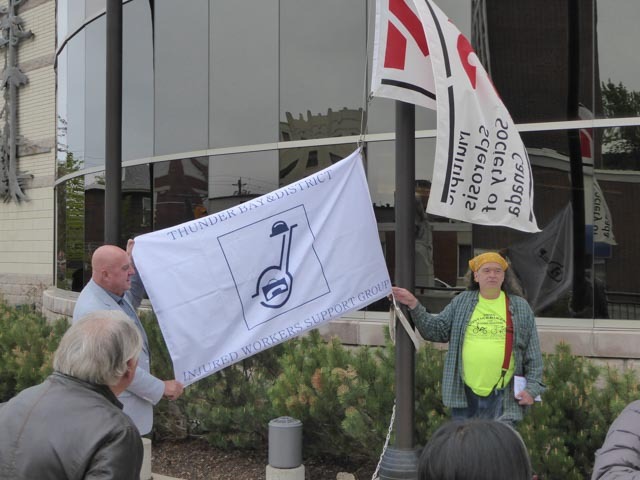 Thunder Bay & District Injured Workers Support Group President, Eugene Lefrancois, and Mayor Hobbs raise the injured workers flag on June 1st, in recognition of Injured Workers Day. On June 1, 1983 a coalition called “The Association of Injured Workers’ Groups” (AIWG) attended Queen’s Park en masse to make a deputation to a government committee contemplating changes to the Workers Compensation Act in Ontario, that would remove disability pensions in favour of a wage loss system. Thousands of injured workers, their families and survivors responded to the call to action from the AIWG, forcing the committee to convene the hearing on the steps of the Ontario Legislature, a first in the history of Ontario. Every year since 1983 there has been a June 1 gathering of injured worker groups at Queen’s Park and, on some occasions, other cities and towns in Ontario. It has become “Injured Workers’ Day” in Ontario, a day of pride and protest – the pride of the people who gave so much for the growth of Ontario and, inevitably, an event of protest against the laws and policies that lack so much in recognizing this contribution, but instead create poverty for the permanently disabled. On Friday, June 1 Thunder Bay will take part of this tradition with a Flag Raising Ceremony at City Hall at 10 AM. 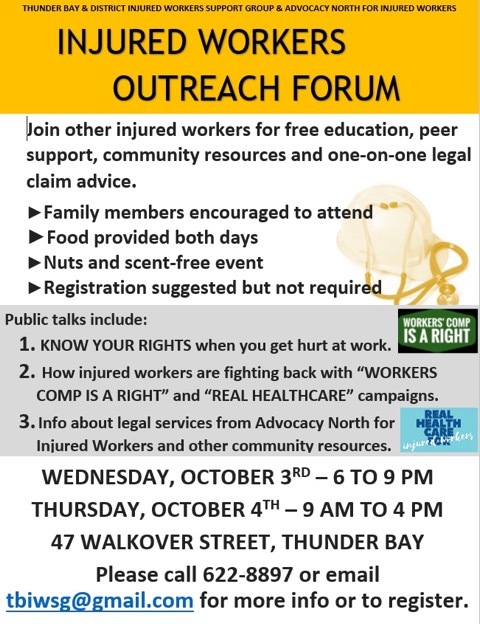 Injured workers, their families and survivors, along with concerned and interested members of the public are urged to attend and voice their concerns. As well, local candidates in the provincial election will share their plans for reform. Too often, Injury equals Poverty in Ontario as increasing numbers of permanently disabled injured workers are living at or below the poverty line in Ontario. This is because many workers, about 15,000 each year, end up with a permanent work related disability. Research shows that about 50% are unemployed post injury but only 1 in 5 receive a “disability pension” from the WSIB. In fact, since 2010, the WSIB has doubled their Accident Fund to $35.7 Billion while they cut annual total benefits to injured and disabled workers in half. On April 28, 1914 workers in Ontario gave up the right to sue their employers for damages caused by injuries in the workplace, a very significant sacrifice, in return for compensation for rehabilitation costs and full protection from income loss. This “historic trade-off” means that workers’ compensation is a negotiated right, not an appeal to the generosity of the community conscience. On June 1 injured workers in Thunder Bay will join others across Ontario to highlight the fact that the agreement they made in 1914 is not being fulfilled.